Theresa Powers getting ready to lead the Young at Heart class. Along with good nutrition, exercise is an important part of successful living. Keeping muscles toned has also been proven to prevent falls. 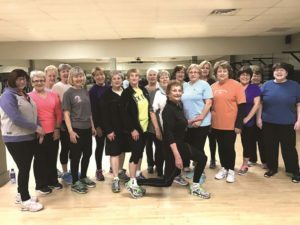 Young at Heart is an exercise program offered three times a week at the Powerhouse Gym in Gaylord. Targeted toward older adults (age 60 and older), but designed for all ages, it combines gentle aerobics and light weights. Certified exercise instructors and assistants provide the leadership for this program. No gym membership is needed to attend, and walk-ins are welcomed. Is transportation to and from the Powerhouse Gym available for classes? The Otsego County Bus System is encouraged and recommended for those needing transportation. To arrange a ride, please call (989) 732-6224. When there is poor weather and the OCCOA is closed, will classes still be held? To protect your safety and well-being, Young at Heart exercise classes will be cancelled whenever the OCCOA is closed, due to poor weather conditions. Agency closure announcements will be available on our Weather Closing Information phone line at (989) 731-5652. Closures will also be posted on this page and the OCCOA home page of this website. The Young at Heart exercise program is sponsored by the Otsego County Commission on Aging.